[vid] Has Mr.Putin been cloned?! Different people (Putin's body doubles) speak, on behalf of Vladimir Putin. They have different manners, shape of the skull (the width of the eye sockets, the shape of the chin, the shape of the zygomatic bone), different amounts of soft tissue and cartilage on the face (the wings of the nose, lips, cheeks), different hairlines (scalp and eyebrows), different eye color, different aspects, they have different hands, different height and a different tone of the voice! "The Strange Death of Adolph Hitler" By Henry Makow Ph.D.
 From jokester to jailbird According to his Toronto lawyer, Daniel Brodsky, Rosato was arrested after repeatedly complaining to police that, in a scenario reminiscent of the film Invasion of the Body Snatchers, the actor's wife and their infant daughter had gone missing, having been replaced by imposters. 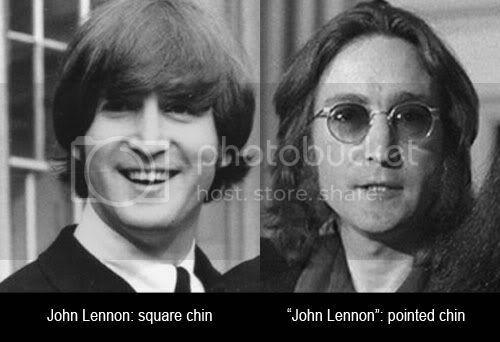 I don't believe in Featles: CIAlebrity impersonator, "John Lennon"
 Dr. Peter David Beter - Audio Letter No. 45. For example, earlier this month on April 11, Vice-President Walter Mondale reportedly left Washington on a trip to Iceland, Scandinavia, and the Netherlands; but, my friends, the man and woman on Air Force II were not Mondale and his wife but actually "doubles." The real Walter and Joan Mondale had been spirited away. ....The real purpose of the trip by Mondale's Bolshevik "double" was to try to obtain oil for Israel, but in this the Mondale "double" failed because very recently Russia's Marshal Dmitry Ustinov--the man now in charge in the Kremlin--had visited Norway personally, and Norway has now come to terms with Russia. ....The weekend after Easter things happened fast, completely unseen by the public. On Friday night, April 20, the real Walter Mondale was being held incommunicado by Bolshevik captors in New Richmond in western Wisconsin. Sometime between 9:30 and 10:00 PM local time, Vice-President Walter Mondale was executed! Mondale had been one of Nelson Rockefeller's closest political allies and had been prominent among the mourners at Rockefeller's memorial service at Riverside Church in early February. Now he had died on a Friday evening, as Rockefeller had, at almost the same local time and from the same cause--a bullet in the forehead. Barely an hour later, Mondale's body was dumped into Lake Superior at a point about 12 miles southeast of Taconite Harbor, Minnesota. 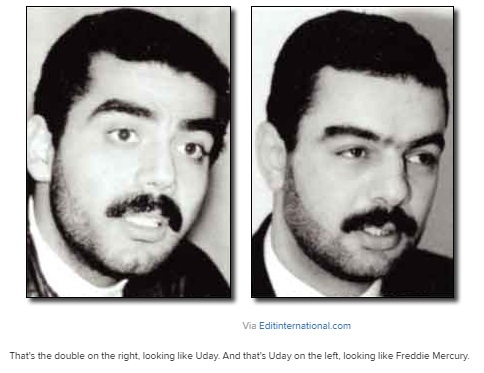 Latif Yahia, a former school mate of Saddam Hussein's son Uday who ended up becoming his unwitting body double. Why Saddam Is Dead... Again You party with Uday at your peril. He's most notorious for a 1988 incident in which he got drunk at a party and killed one of his father's top aides using a pistol and a battery-operated carving knife. That's probably the pick of the bunch, although the list includes wounding an uncle and killing six dancing girls at a party seven years later. From the beginning George Harrison was ALWAYS the same.